Harry Houdini was the greatest escape artist of the 20th century. He escaped from specially made handcuffs and underwater trunks, and once escaped from being buried alive. Now, Janet Yellen will try to become the greatest escape artist of the 21st century. Yellen is handcuffed by weak growth, persistent deflationary trends, political gridlock, and eight years of market manipulation from which there appears to be no escape. Yet, there is one way for Yellen and the Fed to break free of their economic handcuffs, at least in the short run. Yellen’s only escape is to trash the dollar. Investors who see this coming stand to make spectacular gains. Yellen and the Fed face as many constraints as Harry Houdini did in trying to escape a potential collapse of confidence in the U.S. dollar and a possible sovereign debt crisis for the United States. Let’s look at some of the constraints on Yellen – and the possible “tricks” she might use to escape. The first and most important constraint on Fed policy is that the U.S. economy is dead in the water. Quarterly GDP figures have been volatile over the past three years, with annualized real growth as high as 5% in the third quarter of 2014 and as low as minus 1.2% in the first quarter of 2014. We have not seen persistent growth or a definite trend – until now. Finally, there is a trend, and it’s not a good one. Inflation would help to solve the U.S. debt problem because it would lower the real cost of the debt. Making the debt burden sustainable is not about real growth; it’s about nominal growth. Nominal growth is what you get when you add inflation to real growth. For example, if real growth is 2% and inflation is 2%, then nominal growth is 4%. Since debt is repaid with nominal, not real, dollars, then 4% nominal growth is enough to make debt sustainable even if deficits are 3% per year. The problem is that inflation is not 2% (what the Fed wants). Right now, inflation is closer to 1.5%. With 1.5% inflation and 1.23% real growth, nominal growth is still only 2.73%. That’s not enough to sustain deficits of over 3%. The third constraint on the Fed is political gridlock. The Fed might be able to cause some inflation if they could employ “helicopter money.” The use of helicopter money requires cooperation among the White House, Congress, and the Fed. Basically, the White House and Congress would agree on massive spending programs and larger deficits. The Treasury would finance the deficits by issuing more bonds. Then the Fed would buy the bonds with printed money and promise never to sell the bonds. The debt would stay buried on the Fed’s balance sheet possibly forever if “perpetual” bonds were used. Unfortunately for the Fed, there’s almost no possibility of helicopter money this year. The U.S. has to get past the presidential election. They need to see which parties control the House and Senate and then try to achieve some consensus on a new spending program. That won’t happen until February 2017 at the earliest. 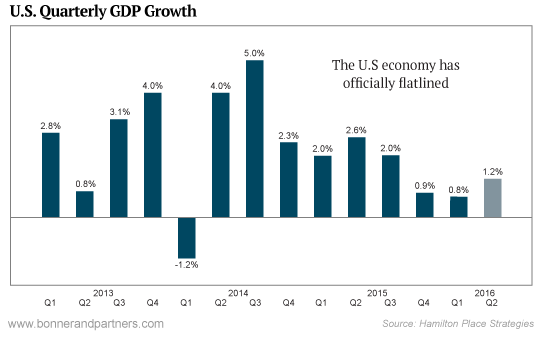 That’s too late to get the U.S. out of its flatline growth trend this year. The fourth constraint on the Fed is their desperate race against time. The Fed needs to raise interest rates so they can cut them when recession hits. The problem is that the U.S. economy may be in recession before the Fed can normalize interest rates. If the Fed cannot cut rates enough to get the economy out of recession, it could become a permanent depression, as what happened in Japan. My own view is that the U.S. has been in a depression since 2007 (defined as persistent below-trend growth). Japan has been in a depression for over 25 years; the U.S. has been in a depression for nine years. The entire world seems headed in the same direction. Here’s the math. Economists estimate that the Fed has to cut interest rates about 350 basis points (3.5%) to offset the effects of a recession and stimulate a return to growth. Today, the Fed funds rate is 0.25%. The Fed would have to raise rates 3.25% before the next recession in order to cut them 3.5% to fight that recession. The problem is that the average U.S. economic expansion since 1980 lasted 79 months. The current expansion has already lasted 85 months. In other words, the next recession is already overdue. If the Fed rushes to raise rates now, they will cause the recession they are trying to avoid. The Fed’s actual policy has been to do nothing and hope for the best, but that strategy is running out of time. Those are the Fed’s handcuffs – weak growth, persistent deflation, no helicopter money, and no ability to cut rates to avoid a recession. How can the Fed escape these constraints? How can the Fed get the inflation it needs to both sustain the debt and facilitate rate hikes? There are four ways to get inflation when rate cuts are off the table. These four ways are helicopter money, world money, higher gold prices, and currency wars. As mentioned, we may see helicopter money in 2017 if there’s political will in Congress and the White House. But helicopter money does not guarantee inflation. People and companies on the receiving end of government deficit spending may just save the money or pay down debt instead of spending more themselves. This behavior negates the “multiplier effect.” But that doesn’t mean it won’t be used anyway. The Fed never lets reality get in the way of trying out a bad idea. The second way to get inflation is for the IMF to issue world money in the form of special drawing rights, SDRs. This may happen in the next global financial crisis, but it won’t happen in the short run. The IMF moves even more slowly than the Fed. SDRs may be issued in sufficient size to cause inflation in 2018. But it’s unlikely to happen before then. The third way to get inflation is for governments to dictate a higher price for gold, perhaps $3,000 per ounce or higher. The idea is not to reward gold investors. The idea is to devalue the dollar relative to gold so the dollar price of everything else goes up. The U.S. government did this with some success in 1933 when it raised the price of gold by 70% in the middle of the Great Depression. However, this method is so extreme from a central banker’s perspective that I don’t expect it in the most desperate circumstances. We may see this in 2019, but it’s unlikely to happen sooner. That doesn’t mean gold won’t go up on its own – it will. It’s just that investors should not expect the government to force the price higher by official action anytime soon. If we can potentially expect helicopter money in 2017, SDRs in 2018, and a high official gold price in 2019, what can we expect here and now? How can the Fed cause inflation in 2016? There’s only one way to escape the room right now – currency wars. The Fed can trash the dollar and import inflation in the form of higher import prices. You can bet a cheap dollar will be on the agenda Sept. 4, 2016, when the G-20 leaders meet in Hangzhou, China. A cheaper dollar is a complicated play because it involves other currencies. If the dollar goes down, something else has to go up. It won’t be the Chinese yuan or pound sterling. China and the U.K. have serious growth problems of their own and need a cheap currency too. If the dollar goes down, then the three forms of money that have to go up are the yen, the euro, and gold.